Tipped as the ‘new, modern publishing experience’, the widely anticipated WordPress update 5.0 also known as Gutenberg is due imminently but what can WordPress users expect? This blog post explores not only what you should expect in the much-anticipated update but also how to prepare for it. WordPress 5.0 is set to be the most significant WordPress release in 5 years and this is mostly due to Gutenberg. The new Gutenberg editor is the most significant feature of WordPress 5.0 as it will completely change the way we use WordPress. The main aim of Gutenberg is to elevate WordPress further in front of its competitors by making their interface more straightforward and more accessible for users to create engaging web pages without the technical knowledge that was previously required. The changes will be rolled out in three stages with the initial phase focusing on a “content-first approach” say WordPress. The new Gutenberg editor is entirely taking over from the existing Tiny MCE Editor. Instead, the new editor will use a visual interface which aims to make it easier for non-programmers to arrange visual elements within a page using blocks. From inserting images to adding bulleted lists, moving forwards everything to do with posts and pages will be created in blocks. Gutenberg blocks will enable you to focus on how your content will look without the distraction of other configuration options, helping you to present your content in a way that is engaging and visual. The new Gutenberg editor takes precedence over the other features in 5.0 however, further updates will offer a complete change to the whole WordPress back-end and framework, as well as the way content is rendered. Expect further changes to the way themes, plugins and widgets function, as well as the removal of the ‘well-known’ WordPress toolbar. You may have noticed the introduction of Gutenberg editor in your CMS. We recommend that users ‘Try Gutenberg’ to get a sense of the new interface. You can do this by ticking the “new editor” box in screen options. However, before embarking on this, we do suggest that users take a backup of their site especially ahead of the WordPress 5.0 launch. Created with users in mind WordPress 5.0 will be a learning curve for all of us. If you have any questions about WordPress 5.0, we welcome you to contact our team. CuroHosting perform automatic updates of WordPress core, themes and plugins on a regular basis. 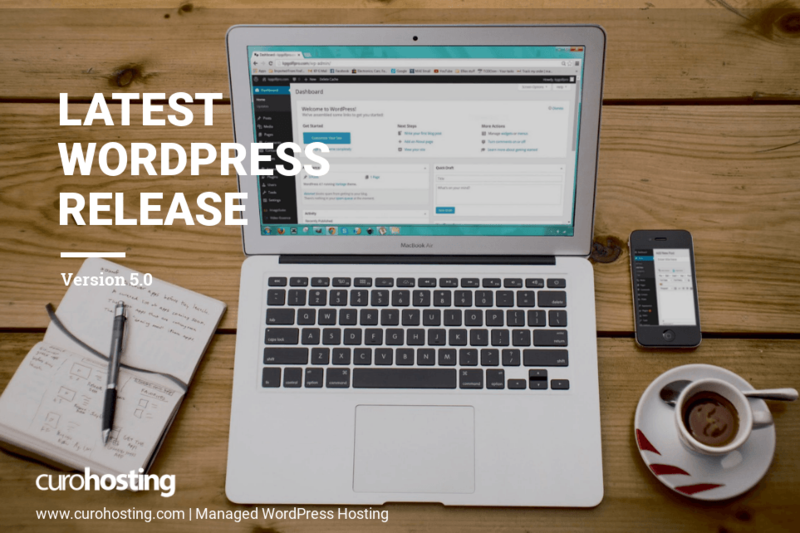 Our clients’ WordPress sites will be updated to WordPress 5.0 once the update is released. Learn more about our Managed WordPress Hosting solutions and trial them free for 14 days. Find out more about previous WordPress versions such as 4.9.8 or 4.9.7.